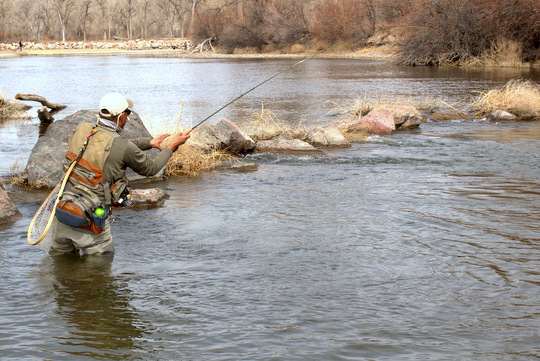 For the past several weeks, plans were in place to go fishing this weekend. 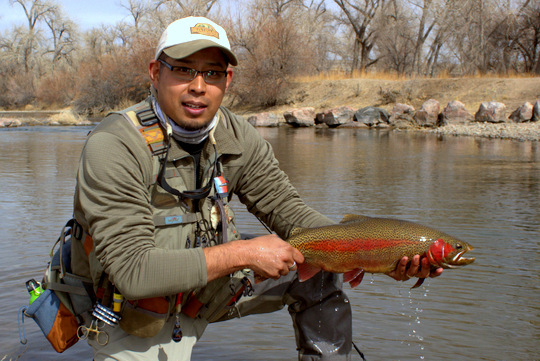 I had been trying to fish with Juan Ramirez from over at the Hopper Juan for a few months now, but getting our schedules to align was proving difficult. This weekend would be different....until I got sick. Not wanting to put the trip off, I was really hoping that I would get well. Just in time, my fever broke on Thursday, and I was feeling significantly better by Saturday. 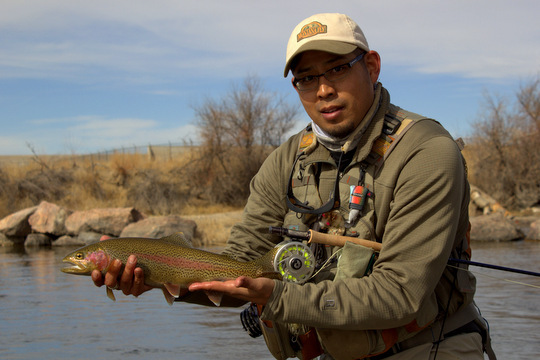 Sunday morning I was up bright and early to spend a few hours on the Arkansas River in Pueblo chasing those big rainbows. Smooth sailing down the Interstate with only light traffic had me on time to meet Juan in Colorado Springs where he guides out of. After a quick transfer of my stuff to his car, we were continuing south. In the two trips I have made to the Arkansas thus far, I only fished in the vicinity of the Nature Center. Juan wanted to show me some new water so we headed just upstream to the Valco Parking lot. After paying for our parking, we started to rig up. Only minutes later, a ranger showed up checking cars. I was amazed at how aggressively they patrol this lot. My recommendation is to NOT try and skip paying as you will get caught and it was worth the money to fish that stream. 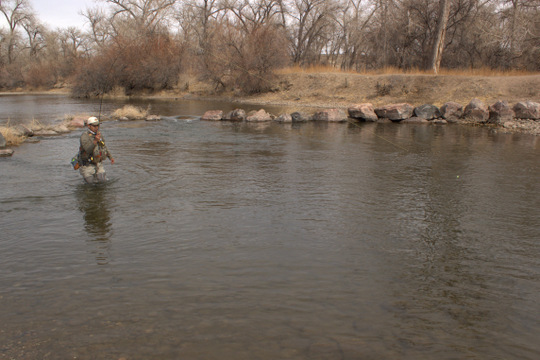 Heading down to the stream, we worked our way up the river until we passed most of the other anglers and found some open water for ourselves. We both rigged up and were soon plying the cold waters in search of trout. Some days start off quickly while others take a while to get on the board so to speak. The only trout we noticed was one swirling on something downstream but nothing was eating our flies. Moving on up the river, we came to a perfect spot. Two pools close together that would allow both of us some space to operate. That's when Juan started to put on a clinic and show everyone nearby how it's done. After catching a couple of nice rainbows, he insisted that I try his hole. First I asked what the fish were eating. After downsizing my fly significantly, I stepped up. First cast, BAM!!! Chuckling a bit at how easy it was, I moved back down to my original pool. I wanted to find out if it was the spot or the fly. Two drifts later I hooked up and that's when I was convinced that fishing with a guide is not a bad idea. I can be lazy and let them figure out what the fish are eating! We both wore out our respective holes. 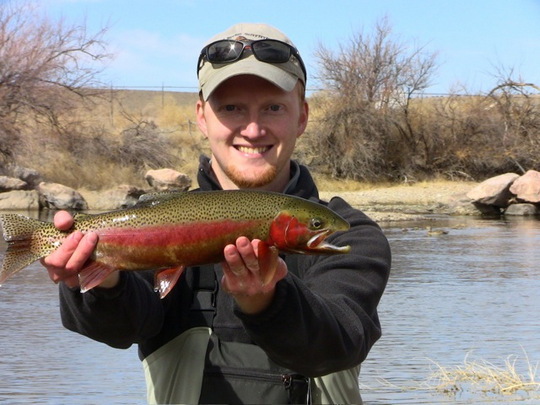 I found two nice fish including a colored up male that was around 18 inches as well as a super fat silver rainbow that was a bit shorter. Eventually, we had either stuck or spooked most of the fish close by and got the itch to explore some more. Moving up the river, we came upon another nice pool. All of the work done to improve the stream habitat is paying off in a big way. The fish have tons of good holding water and are utilizing it to really grow big! In the new pool, I started working some submerged boulders while Juan hit the top. Soon he was hooked up again. 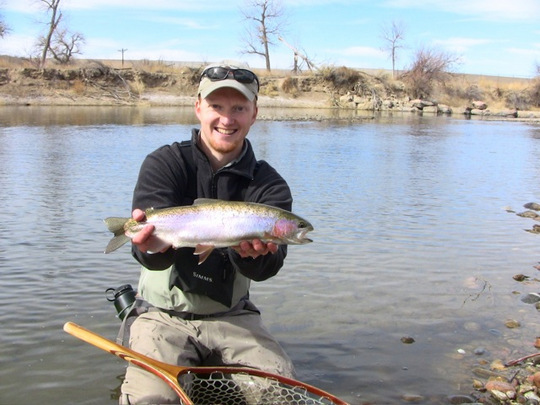 The fish were really colored nicely and a few redds on the river explained the bright colors. Juan found a nice fish up above me about the same time I snagged my rig on one of the underwater rocks and broke off. 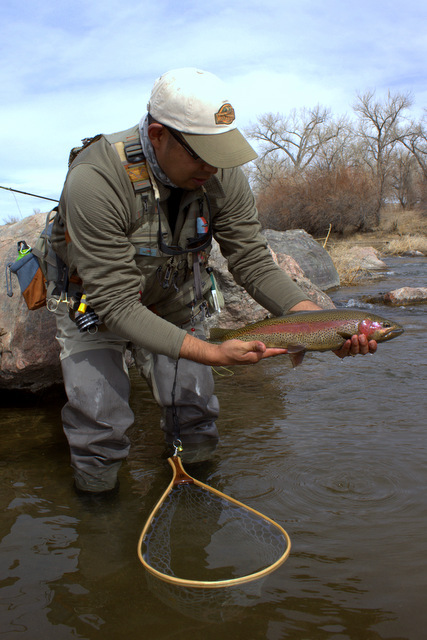 I sat down to tie on some new flies, but also worked the camera whenever Juan would hook a good fish. What happened next was awesome. A kid fishing across the river had just broke off a big fish a bit earlier. 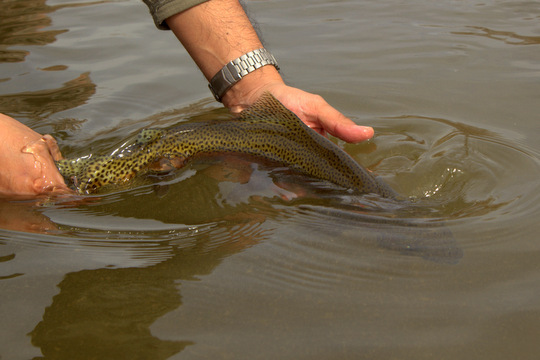 Juan cast a tiny #26 emerger into the head of the pool when a big rainbow came up and sipped it off the top (there's a whole story there as well but I'll leave that one for Juan to tell, but trust me...its a good one). 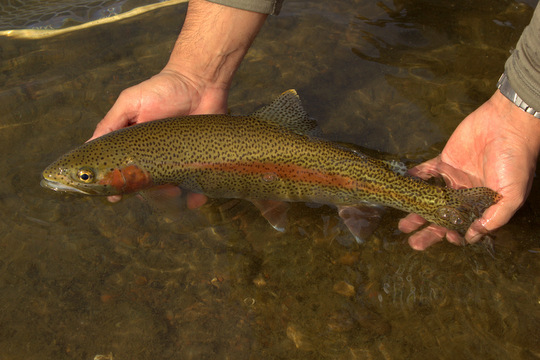 He was now attached to a rather hefty trout that took him up and down the pool, always in close pursuit. 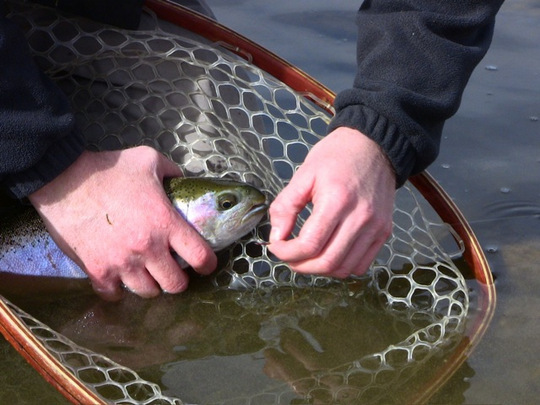 Eventually, the fish tired and he was able to get the net under it. As he was removing his fly, he discovered another stuck in the fish. It was the fly the kid had just lost which was confirmed when the kid came around to our side of the river on the way downstream to see. I got out my camera and had a great time shooting pictures of this amazing fish. Soon it slipped back into the current, ready for another lucky angler to find some day. That fish was the high point of the trip, and soon we were getting tired as well as hungry. We decided to call it a day after walking back to the car and finding people in basically every hole. It had been a great trip, and I look forward to getting out on the water with Juan again sometime! Glad you enjoyed it Gerry! What a trip, yes a guide does pay off. Those are some absolute beautiful rainbows. What prove to be the best pattern for the trip? 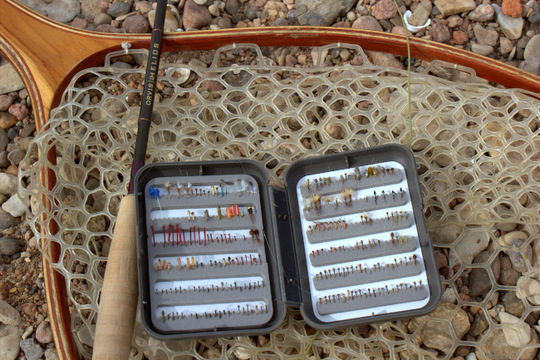 Were you using a 5 wt fly rod or 6 wt.? Thanks for sharing a great trip!! Great report David! making me jealous. Thanks Travis! You would enjoy this river. Your midge fishing skills would be perfect on this one!!! 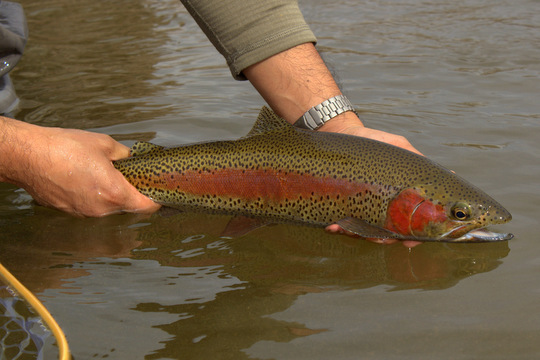 Those are some absolutely stunning Rainbows! Those are great fish. I guess the quality of the fish and fishing explains the rod pressure. This side of the world we encounter very few fisherman, if any, when we fish a river, but it looks like you have one over us on the size and number of fish! 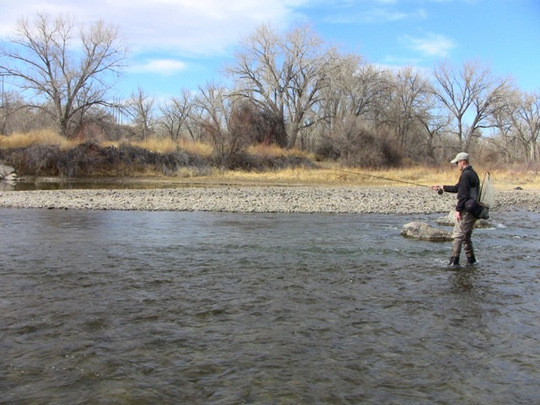 As much as I enjoy fishing this river, I would trade large fish and more fish for a day on a stream without any other anglers...solitude is something special! My jealousy is overwhelming right now. I hope you, Juan and I get a chance to fish there when the weather is more suited for an old guy. I'm tying caddis like crazy in anticipation. Howard, we definitely need to make it happen! What a great day it was! Not only getting to meet and fish with Juan, but, having tremendous success on those beautiful fish. The "River" is calling my name. Please tell me that I don't have to tie a #24 or #26 on to run with you guys down there! Mel, you are welcome to fish with us without using small flies. However, I can't guarantee anything about catching fish. How about this: I'll tie the little flies on for you if they are required...? I'm about ready to fish again if we can catch a break in the weather. We need to fish again soon! Dream Stream perhaps?